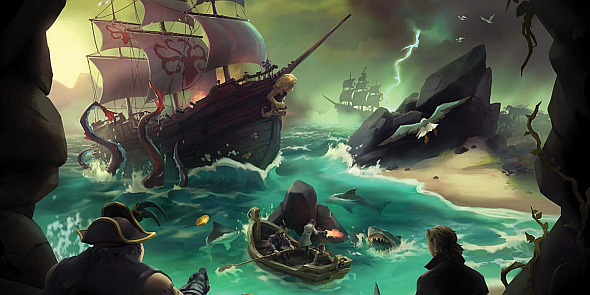 Sea of Thieves is a game that lets you make your own fun with a variety of tools and a massive, naval world to adventure across. Though it is very much a sandbox-style game, there are a bunch of guided activities you can take part in as well. Which guild should you buddy up with, though? Do The Gold Hoarders speak to your piratical passions, or are you more of a Order of Souls sort of person? If you wander around muttering about leaden keys, crooked rhymes, and summoning the bone-lord you may just have found your guild. If you’ve never worn a hooded cloak and don’t own a skull collection, though, perhaps The Merchants Alliance are your jam. But we’ll cover all that below, along with raids, public events, and much more. Pop down that accordion for just a second, and we’ll get started, eh? Thank you. Here is a rundown of what is available at launch. Hey! Do you hate rules and love creating? Try the best sandbox games on PC. 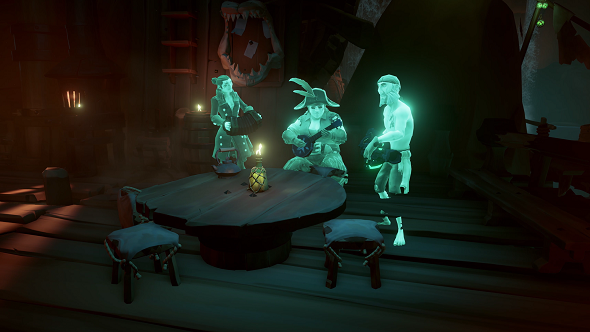 Sea of Thieves lets you accept quests from three different guilds, building up three different reputation progression systems and unlocking rewards for each. Here are each of the guilds, what kind of missions they offer, and the types of rewards you get for completing them. 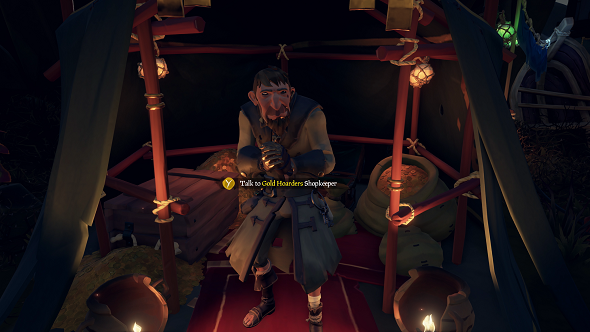 As their name suggests, the Gold Hoarders are all about shiny things. They give you quests to track down buried treasure on forgotten islands. You must head to an island and figure out the location of the treasure using the red ‘x’ on the map in relation to the island’s landmarks, or by following the clues found in a riddle. Do not go looking for quest guides online because these missions will be different every time. Quests to uncover buried treasure are procedurally generated. The game chooses an island, picks a landmark, places the chest somewhere around it, then generates a riddle based on its location. Each guild gives out rewards that represent their playstyle, so expect fancy new shovels and compasses from the Gold Hoarders. The Order of Souls are all about bounty hunts. 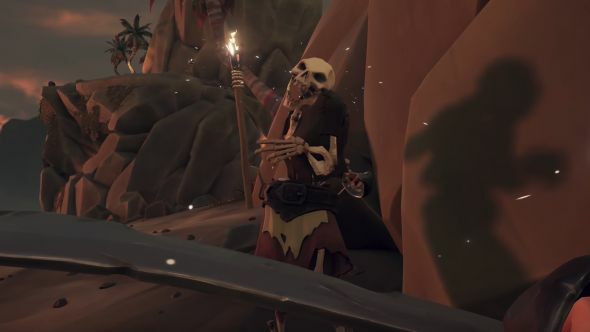 Their missions will send you to an island where you will fight some skeletons, kill the undead captain, and then try to deliver its skull back to the guild. 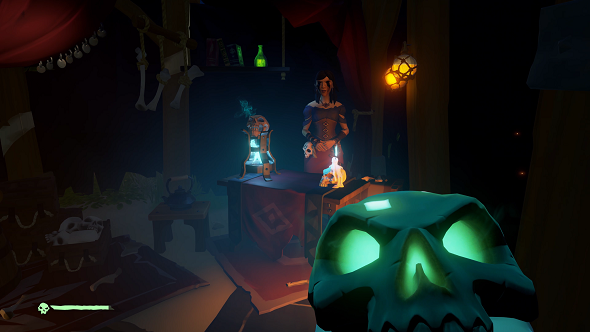 Not only will you have to contend with other pirates along the way, you will also have to put up with the skull whispering in your ear. For your troubles, you will unlock swanky lanterns and tankards. 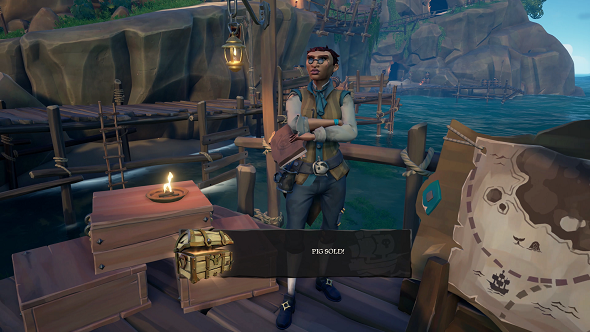 Accepting missions for The Merchants Alliance will task you with ferrying chickens, pigs, and snakes across the open seas. You will have to keep your animals alive as well as keep other players away from them. Stop snakes from attacking your pigs with a venoumous bite by singing them a shanty, feed your pigs bananas throughout the journey, and make sure they don’t drown below deck if you are caught in a storm. Since some of these objectives are timed you will unlock fancy new pocket watches for completing them. You can also get new spy glasses to keep an eye out for any would-be robbers. On top of guilds, Sea of Thieves has emergent events that you can take part in. These events will draw in every player sailing nearby, so make sure you are well stocked if you decide to wade in. This massive beast will emerge from inky black waters, with two tentacles enveloping your galleon and tearing it apart, as the other tentacles grab players and dunk them underwater or slam them onto the deck. Defeating it will provide you with excellent rewards, so fire every cannon and slice at every tentacle. The Kraken’s weak spots are the very tips of the tentacles, so hit there for increased damage. The Kraken can show up in the world through mysterious circumstances, allowing you the chance to team up and fight it. There is also a secret way to summon the creature in-game, just in case you are a masochist, although players have yet to work this out. For your best chances of seeing one, be sure to explore the deepest waters and watch out for inky patches of ocean. Islands can sometimes incubate skeletons and become Skeleton Forts, in which case they are highlighted by a skull-shaped cloud hanging over the top of them that pulsates. Skeleton Forts are filled with bony baddies that you need to clear out. Right in the middle of them is a Skeleton Captain – kill him and he drops a physical key to a vault of goodies in the island’s bowels. These vaults contain so much treasure that it will take a single crew multiple trips to get it all back to their vessel. You can either try get it all yourself, work with other crews and share the loot, steal the loot from another crew, or do a last-minute double-cross on your temporary allies. Due to that massive skull in the sky acting as a beacon there will be plenty of rival crews looking to nab the riches.